Ans: Partners in Population and Development (PPD) is an Inter-governmental Alliance of 25 developing countries with a mission to expand and improve South-South collaboration in the fields of family planning and reproductive health, population and development through the governments, NGOs and private sector organizations. It was created at the International Conference on Population and Development (ICPD) in Cairo in 1994. Ques: Who are the members of this Alliance? Ans: PPD Members are developing countries committed to the implementation of the ICPD Programme of Action, willing to provide political, technical and financial support to South-South Cooperation. Ques: Where it is located? 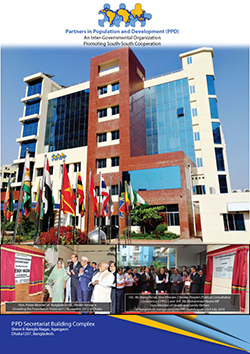 Ans: The Secretariat of PPD is located in Dhaka, Bangladesh. However, it has a Regional Office located in Kampala, Uganda, a UN Observer’s Office, located in New York and a Program Office located in Taicang, China. PPD country offices are located within the Health Ministry of the respective member country. Ques: What is PPD Mission and Vision? By the year 2014, Partners in Population and Development, as an Intergovernmental Organization, is driving the global reproductive health and population agenda to attain sustainable development. To assist Member Countries and other developing countries to address successfully the sexual and reproductive health and rights, including family planning (FP) and HIV/AIDS, population and development challenges through South-South Collaboration by raising a common voice and sharing sustainable, effective, efficient, accessible and acceptable solutions considering the diverse economic, social, political, religious and cultural characteristics of our countries. Ques: What are its Goals? Goal 1: Strengthened South-South Cooperation in Population and Development through advocacy, policy dialogue, exchange of information and sharing of expertise, experience and technologies among developing countries. Goal 2: Strengthened capacities at systems, institutional and individual levels in Member Countries through training, research and information and experience sharing. Goal 3: Strengthened networks and partnerships with institutions, civil society organizations, and private sector and development partners. Goal 4: Improved voluntary FP and other reproductive health services utilizing rights-based, gender and culturally sensitive approaches in particular through increasing integration of RH and HIV/AIDS and improved RHCS. Goal 5: Enhanced resource availability including greater mobilization of resources from member countries and from donor countries/organizations for South-South Cooperation. Goal 6: Strengthened PPD through strengthened human resource base and improved programme collaboration with non-member countries. Ques: What are the Priorities of the Organization? Improving Reproductive Health Commodity Security (RHCS) –access to affordable RH commodities –with particular focus on the poor and vulnerable segments of the population. Ques: Who runs this Organization? Ans: PPD operates globally with its member countries through its Board Members who are mainly Ministers of Population, Health and Development and Partner Country Coordinators (PCCs) who are also high level government officials. It has closer partnership with 17 premier institutions, known as Partner Institutions (PIs) in member countries which gives it a unique advantage in undertaking capacity development activities, in organizing policy advocacy, in identifying and documenting lesson learned among others. PPD has a Secretariat located in Dhaka Bangladesh, a Regional Office for Africa at Kampala, Uganda, a Programme Office at Taicang, China and a Permanent Observer’s Office for United Nations at New York, USA. It is headed by an Executive Director. Ques: How the Governance of PPD is formed? Governing Body - The Governance structure of PPD is integrated in the Board, and the Executive Committee, which formulates the policies and monitors the activities. The Board is consisted mainly with the Ministers of Health, Population and Social Development from the Member States. The leadership of the Board consists of the Chair, the vice-Chair, the Secretary and the Treasurer elected by the Board of a three-year term and who constitute the Executive Committee of the Organization. The Board meets once a year to discuss governance, policy, and programmatic and financial issues while the Executive Committee meets twice a year before the Board meeting is held to provide guidance to and evaluate the achievements of the organization. The By-laws signed by each member state regulate the governance and functioning of the organization. Implementing Bodies - The bodies responsible for the overall implementation and follow-up of PPD programs and projects are the Partner Country Coordinators (PCC) at the Partner Country level, Regional office at the regional level, and the PPD Secretariat. Advisory Body - The body responsible for the provision of guidance, advice and technical assistance to PPD programs and projects is the International Program Advisory Committee (IPAC). Click here to see the list of Members. Collaborative and Networking bodies - The bodies responsible to encourage collaboration with key institutions and organizations at both, national and regional level are the network of institutions (governmental and non-governmental) which collaborate in PPD programs and projects, the regional reproductive health networks, and the National Support Structure. Ques: What are the current activities of the Organization? Encouraging the PIs to integrate the contents of these generic modules into their ongoing activities. The founding mandate of PPD was that countries in the South have among them unique practices, resources and knowledge, particularly in the fields of Family Planning, and Sexual and reproductive Health, which could be shared with other countries of the South to help them in formulation and implementation of policies and programs. Therefore, information and knowledge sharing for capacity building are among the core programmatic areas of PPD. The PPD website successfully acts as the central point or the clearing house of information relating to member countries – their profiles, demographic data, best practices, list of centres of excellence, programs undertaken to further South-South Collaboration. PPD has also developed a number of advocacy tools to promote PPD’s global agenda on Family Planning, and Sexual and Reproductive health. These include a myriad of publications including a Handbook for the Consultants, Report on Real Life Experience Sharing on Consulting for Reproductive Health, four Generic Modules for capacity Development and a booklet with overview of PPD PIs. In addition, PPD publishes a bi-monthly newsletter titled PPD Watch to highlight PPD and Member Country activities and achievements. All the above information resources could be found in the PPD website as well. Exchange experiences and expertise with other professionals. The fellowship program is offered to professionals in the fields of population, family planning and sexual and reproductive health including both member and non-member countries from the South. The fellowship program has become a significant mechanism for mobilization financial and technical resources from and for the South. PPD so far offered about four hundred scholarship to member country professionals. Success in RH/Family Planning programs and promotion of commodity supplies is key component to the achievement of the MDGs. Through its Reproductive Health Commodity Supply (RHCS) Program, PPD aims at exchanging information about research and development of RH commodities in various countries of the South, analyzing problems in RHCS and thereby promoting South-South Cooperation (SSC) in this particular domain. Due to pressing demand and challenges to countries of the South in RHCS and service, PPD mobilizes resources to enhance political commitment by the government from Member Countries to increase expenditures on RH commodities, on the one hand; and to reinforce capacity, commodity quality as well as information exchange on the other hand. PPD is also networking with the private sector, eventually the drug manufacturers and enable them share successful purchases that would enable improve the quality of products and adapt WHO pre-qualification standards in production of RH commodities. PPD is also an Executive Member of the Reproductive Health Supplies Coalition (RHSC) and provides support to all the 99 Members of the RHSC globally for the enhancement of Reproductive Health Commodity Supply and Services. Research, Monitoring and Evaluation, among others. Partnerships with NGOs, civil society organizations and other Stakeholders have also been enhanced through the Private and Public Partnership Initiative. Working to improve opportunities for RH, Population and Development programs for Member Countries, PPD, through its advocacy program, lends assistance to a large number of audiences and professional groups in the field of RH, to strengthen their role as promoters of leadership and actors of tangible social change in the South. In this regard, PPD has provided fertile ground for collaboration with Member Countries with involvement of Actors of tangible social change in the south. In this regard, PPD has provided fertile ground for collaboration with Member Countries with involvement of Actors engaged in Reproductive Health, Population, Policy Advocacy and Development programs among other issues. As component of this effort, PPD has prepared and disseminated a wide range of policy materials, organized advocacy campaign as well as policy dialogues, and provides assistance to member countries mainly to promoting South-South Cooperation in the areas of Reproductive Health, Population and Development. Ques: How can one be a member of this Organization? It must agree to pay an accelerated annual membership fee. The minimum fee shall be US$ 20,000 annually. Countries applying for membership will submit an application letter to the Chair of the PPD Board. A country profile and the country’s reproductive health strategic plan needed to be submitted together with the application letter. Ques: Who funds this organization? Ans: PPD is partly supported by the Member Countries themselves. Since PPD’s inception, the Rockefeller Foundation, the William and Flora Hewlett Foundation, the Ford Foundation, UNFPA, the World Bank, and more recently other foundations such as Bill and Melinda Gates Foundation, Packard Foundation, the Royal Dutch Government, the Andrew Mellon Foundation, Venture Strategies, Population Communication and OXFAM Quebec has supported it. Bilateral and multilateral donors such as USAID, DFID, DSW and the European Commission have also provided generous financial assistance to PPD. Ques: Which are the countries it operates? Ans: While PPD activities are not limited to only its member countries, it generally operates through and with its member states as mentioned above. Ques: What are its present programs?